Are you looking for a device that will keep you connected when you’re on the road? If so, you might be considering a ham radio, a two-way radio or a CB radio. Of the three options, most people recommend the third choice for in-vehicle communication only. While a handheld ham radio can certainly be a great communication tool in a motor vehicle, you need a license to operate one; and, while a long-range two-way radio might be work in some situations, they aren’t always reliable. CB radios, on the other hand, can communicate over long distances and you don’t need to have a license to operate one; hence the reason why so many people opt for them for vehicle to vehicle communication. Like most technological devices, there are a lot of CB radios on the market to choose from. To help you find the most reliable, durable, and easy to operate CB, we’ve conducted extensive research and compiled a list of what we consider to be the top five CB radios available today. To learn more about each option, read through the following reviews. When you’ve decided on one that suits your needs, click on the yellow link to find the best prices currently Available on Amazon. The first option on our list of the best CB radios is the President McKinley USA 40 Channel CB Radio. This device is lightweight and compact, so you shouldn’t have any trouble fitting it in the cab of your truck securing it to the dash of your car. It also boasts all of the features that you could possibly need to stay in touch when you’re on the road. Plus, since it’s a President McKinley, one of the best names in CB radios, you can be sure that it is durable and reliable. This CB radio was built to withstand harsh conditions; it can take on dust and the most rugged terrain imaginable with ease, making it the perfect choice for when you’re off-roading in your Jeep or if you tend to come into harsh conditions in your commercial vehicle. With access to weather bands and NOAA alerts, you can stay on top of the weather and you’ll even be notified when severe storms or other emergencies arise. The large LCD display is bright and can be seen in all types of lighting; plus, you can choose from one of three colors. Other key features include mic and RF grain controls, switchable talkback, a noise blanker, a variable RF power control, automatic squelch control, and ANL. It also comes with everything you need, including a power cord, mounting bracket, and mic. Final Verdict: The President McKinley USA 40 Channel CB Radio is one of the best CBs on the market. It offers all of the features you could possibly need and it’s exceptionally durable, compact, and lightweight. It has received amazing reviews across the board, despite a few users saying that they though the device they received was defective. 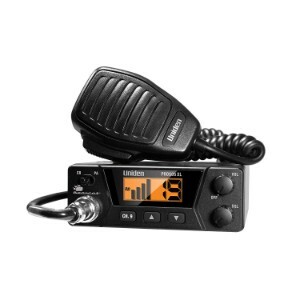 If you’re looking for a CB that gets incredible range, the Cobra 29 LX MAX Smart Full Featured Professional CB Radio is definitely an option worth considering. With a range of 13 miles, it beats any long-range walkie talkie because you don’t have to be in an unobstructed area to get that kind of distance; plus it’s super durable and offers some pretty incredible features. With this CB radio, you’ll be able to stay alert to speed traps, road hazards, and red light cameras, thanks to iRADAR. Ten NOAA weather channels will let you know when inclement weather is on the horizon; plus, you’ll receive alerts when severe storms or other emergencies are in your area. This CB is outfitted with Bluetooth, so you can connect your phone and legally use it while driving; plus, the noise cancelling microphone keeps your conversations clear. A rewind-say-again feature automatically records the last 10 seconds of missed messages and can be used to record memos, too. The bright LCD display is easy to see in any lighting and can be changed to four different colors. This CB radio really does have it all! Final Verdict: Overall, we were very impressed with the COBRA 29 LX MAX Smart Full Featured Professional CB Radio. It’s feature-rich and offers long-distance range to provide reliable over-the-road communication. Next up on our list of the best CB radios is the Galaxy DX-959B Mobile CB Radio. Offering a range of useful features and robust hardware, this CB will certainly meet your communication needs when you’re on the road. This device can use both SSB and AM modes, as well as a Galaxy Noise Filter Circuit (GNF), which allows for clearer transmission and assists with the recovery of poor SSB signals. A five-digit frequency counter is easy to see, thanks to the oversized blue lighting. An easy to operate Galaxy meter, complete with 4 scales and S meter showcases up to 60 dB over S9. The LED backlit display allows for easy visibility in any light, and there’s also a dimming feature, which helps to minimize distractions. The main display illustrates the channel that’s currently in use; plus, there’s an additional display with a five-digit frequency counter. With a variable talkback feature, you can adjust the gain and volume of your transmission. It’s also backed by a two year limited warranty and comes complete with a microphone, mounting hardware for both the radio and the microphone, and a power cord. Final Verdict: The Galaxy DX-959B Mobile CB Radio is a rugged, durable, feature-rich CB radio that offers great signal strength, is easy to use, and can use both SSB and AM modes. While the price is a bit on the high side and it doesn’t offer weather alerts, it’s still a great option for over-the-road communication. While the Midland 75-822 40 Channel CB-Way Radio may look like a walkie talkie, it’s anything but. 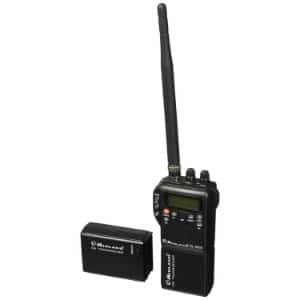 Since it’s a handheld CB, it operates much like other handheld communication devices, such as a business two-way radio, a long range walkie talkie, or a waterproof two-way radio, but it offers much better range than any of these devices, so you can be sure that you’ll be able to stay connected over the road. Since it’s handheld, it’s totally portable; you can easily transition from your vehicle to a rest stop to hotel, or anywhere else with this device. Because of the small size, you can easily fit this device anywhere in your vehicle. The backlit display is bright enough to see in any type of lighting, yet it isn’t blinding. This device offers all standard 40 CB channels, as well as 10 NOAA weather channels, so you can stay current with the latest forecast. Automatic squelch controls enhance the reception in areas where signals are weaker, as well as eliminate background noise to improve sound quality. With a dual channel watch, you can keep tabs on emergency channels, as well as channels that are more suited for your needs. This device runs on either six AA batteries or an adapter, which can be used to charge it up in your vehicle. It’s also backed by a one year manufacturer warranty. Final Verdict: If you’re looking for a portable CB radio, the Galaxy DX-959B Mobile CB Radio is a great option to consider. Because it’s portable, you can use it anywhere; plus, it fits into most vehicles with ease. It offers access to all 40 CB channels, as well as 10 NOAA channels for instant weather updates. Easy to use and offering all of the necessities, this device is a great choice for portable communication. Last up on our list of the best CB radios is the Uniden PRO5o5XL 40 Channel CB Radio. If you’re looking for a starter CB that is very budget-friendly, this is a great option to consider. It’s compact, lightweight, easy to use, and offers the basic functions needed to stay connected when you’re on the road. Offering access to all 40 CB channels, as well as instant channel 9 (the emergency channel), you’ll be able to communicate with other truckers, road warriors, or fellow drivers you may be traveling with. It features a signal/RF power indicator, which allows you to check the relative strength of any incoming transmissions. There’s also an external speaker jack, which allows for improved sound quality, as well as an external PA jack, which you can use to connect to a PA speaker. Other notable features include squelch control, volume control, and an easy to operate and reach channel display. It also comes with the necessary mounting hardware and has a small profile, so it will fit in any vehicle with ease. Final Verdict: For an affordable CB radio, the Uniden PRO505XL 40 Channel CB Radio is a good option. 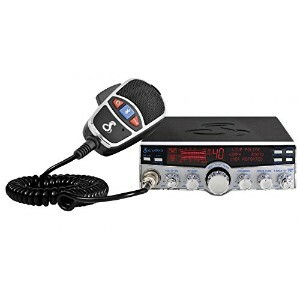 It’s very affordably priced and offers all the basic features that you’d expect in a CB radio. Citizen Band (CB) radios have been around since 1945. They were specifically created to serve as a communication device for laypeople. They’re easy to use, reliable, powerful, and unlike HAM radios and some two-way radios, you don’t need a license to operate one. CB radios are most commonly used for vehicle-to-vehicle communication. They are commonly used by trucks, police, emergency rescuers, and various types of commercial vehicles; however, everyday drivers can certainly use them, too. Range refers to the distance that a CB radio is able to send and receive signals and transmissions. Range varies from device to device and the further the range, the greater your distance of communication will be. Typically, the maximum range is about 10 miles; however, some devices have a shorter range and others may be longer. RF Gain. This feature allows you to block out weak signals so that you can only receive strong ones. It also helps to minimize background noise and to increase the strength of weaker signals. Automatic noise limiter (ANL). This feature also helps to improve sound, as it filters out static and other types of interference, like engine noise. Weather channels. 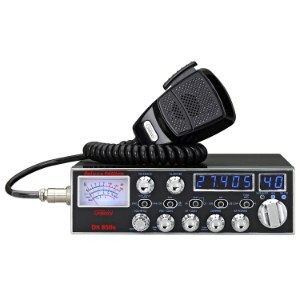 If you want stay current with the weather, a CB radio that has access to NOAA weather channels is a great option. 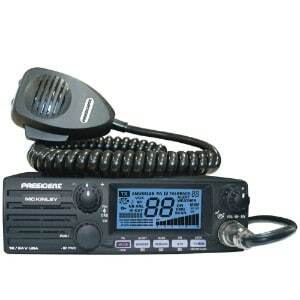 A CB radio is the most commonly used devices for on-the-road communication. Unlike cell phones, which need to be used with hands-free devices, they are legal to use while operating a motor vehicle. They also offer connectivity in areas where there is minimal cell service. Plus, depending on the device you choose, a CB can also offer updates on the weather and other information that might be pertinent while driving.